Anyone who met him would agree with my biased opinion that Remate was a once in a lifetime horse. Words cannot describe how grateful I am that the great Remate joined my stallion herd. 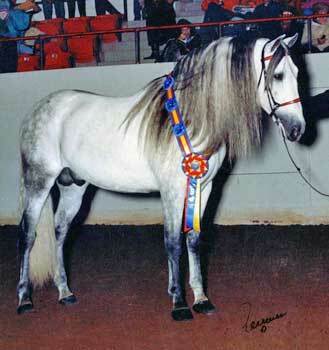 He was the Grand National Champion stallion at the first IALHA Nationals that I ever attended in 1993 and I suppose we never forget horses that make such an impact - never did I even dream that he would someday live with me! 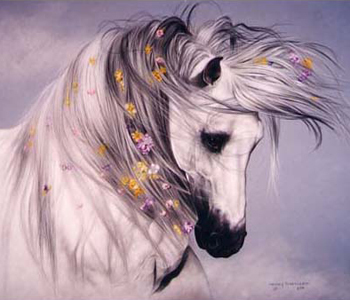 The image of him making his victory lap in all his splendor remains etched in my memory as my romantic ideal of what an Andalusian stallion should be. 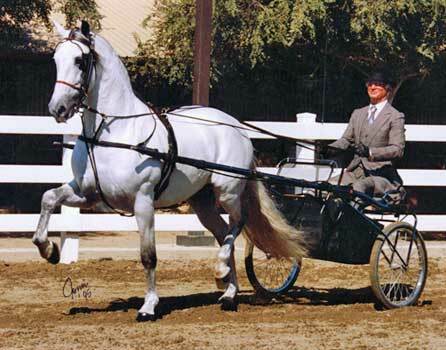 He went on to become National Champion Show Pleasure Driving Horse in 1995, and Grand National Champion of Best Movement in 1997. 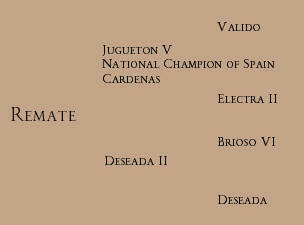 Remate has sired several National Champions, including Senor K, the winner of the 1999 IALHA 3 year old futurity; Galisteo H, 2005 IALHA national champion pre 3 year old; Hermosura H, 2005 IALHA national champion 2 and under psp filly; Destinada DD, 2005 IALHA national champion 2 and under PRE filly; Hipolita H, 2004 IALHA reserve national champion yearling PRE filly and Isabelina H, 2007 IALHA reserve national champion futurity filly. I am very proud that I have some of Remate's offspring or their offspring: Destinada, Hipolita, Isabelina, Vendexa, and Quiana.